TuSimple, which currently operates 11 tractors in Arizona, also said it will begin hauling freight through New Mexico and into Texas early this year. The company made the announcement in conjunction with CES, where it displayed a Navistar International LT model outfitted with its automated driving technology. TuSimple used that truck to demonstrate how its system perceives and interprets the vehicle’s surroundings during the technology trade show, held here Jan. 8-11. “Last year we announced our intent to build a 200-truck fleet, and these 40 trucks that we’re acquiring is a down payment on that,” said Chuck Price, vice president of product at TuSimple. The startup firm, which has dual headquarters in Beijing and San Diego, currently completes three to five trips per day with its self-driving trucks along three fixed routes within Arizona. It also operates a testing facility in Tucson, Ariz.
As part of its business expansion, TuSimple is adding a truck route from Arizona to Texas and plans to start transporting freight to cities such as El Paso, Dallas, Houston and Austin this year, the company said. TuSimple cited growing demand for its freight-hauling services from 12 contracted customers. The technology developer would not disclose the identity of those shippers but said they include Fortune 100 companies and large international firms. “We already have more shipper demand than we can meet, even with the 40 [trucks],” Price said. 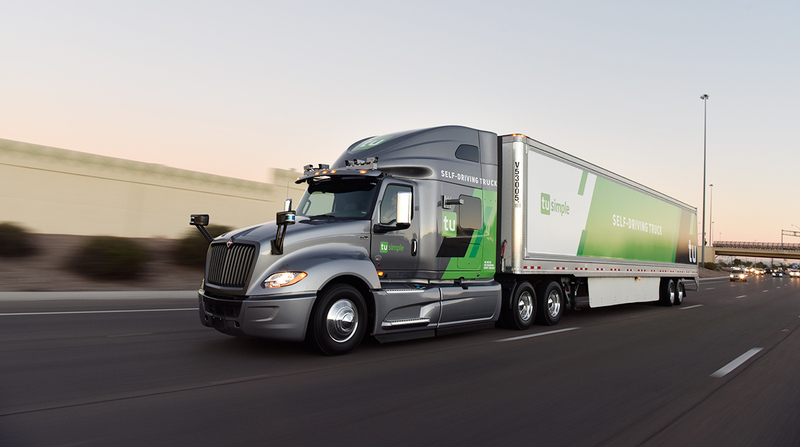 Today, all of TuSimple’s self-driving trucks continue to have a backup driver behind the wheel, but the company is working to reach the point where its trucks can operate autonomously with no one onboard. While TuSimple has said it sees valid business cases for autonomous trucks with or without a driver, the company is placing a heavy emphasis on removing the driver from the vehicle. But many hurdles remain, including further technical development and integration work, as well as regulations and public acceptance. “We believe our technology stack and software will be ready for ‘driver out’ by the end of 2020,” Price said, adding that the company can’t say with confidence that the systems supplied by its partners — the vehicle platform and braking and steering systems, for example — will be ready at that time. “We’re highly motivated to get the driver out when it’s safe, but we won’t pull the driver until all of our partners in this system have each said it’s ready,” he said. TuSimple also is partnering with industry suppliers, including engine maker Cummins Inc., to integrate its automated driving technology with truck powertrains. “We are pleased to work with TuSimple and other companies across the globe to help bring autonomous vehicle technology to commercial markets,” Morgan Andreae, executive director of Cummins’ growth office, said in a press statement. The International model TuSimple exhibited at CES was equipped with an array of nine cameras to monitor the road ahead and the area around the truck, as well as a pair of lidar sensors embedded in mirrors for additional visibility near the vehicle. Unlike many other developers of automated vehicles, TuSimple’s system relies primarily on cameras rather than lidar, which uses light pulses to track the vehicle’s environment. Price acknowledged that the cost and reliability of lidar has improved, but he argued that cameras are a better primary sensor for autonomous trucks. “Lidar’s not good at long range, and trucks need long range,” he said. TuSimple said its camera-based system gives its trucks forward visibility up to 1,000 meters (about 3,281 feet). The company believes the safe perception range for a heavy-duty truck operating at 65 mph is 300 to 500 meters, and seeing up to 1,000 meters ahead makes it easier to keep the truck moving at a constant speed, “which is huge for saving fuel,” Price said. He said TuSimple uses lidar as a secondary sensor to improve visibility in close proximity to the vehicle to help ensure safe lane changes, for example. In addition to the International truck on display at CES, TuSimple also operates retrofitted models from Peterbilt Motors Co.
“We would like our technology to be on every brand of truck, so we’re talking with every OEM,” Price said.